For you who doesn’t know this brand, A’Pieu is a sister brand of Missha from Korea. Honestly, I didn’t know this brand until they have a booming collaboration with one of the famous character from Japan. I love crayon shincan since I was little. 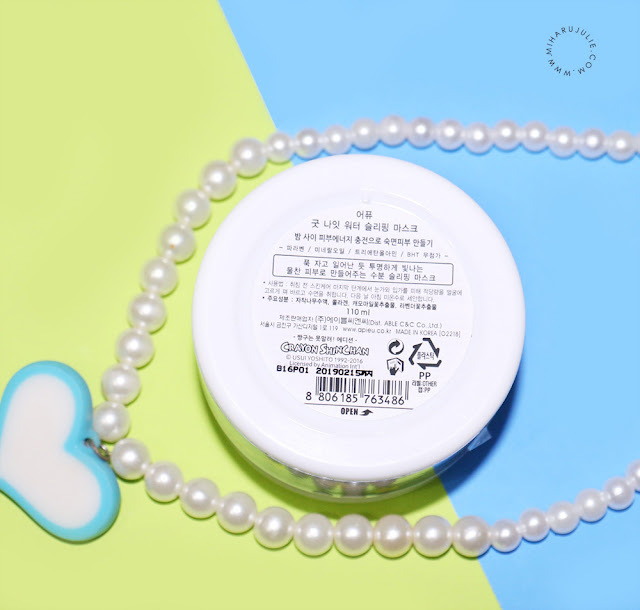 So when I heard about their collab, I decided to buy one of their product which is A'PIEU Good Night Water Sleeping Mask Crayon Shinchan Edition. I admit, sometimes I buy Korean cosmetics blindly because of the cute packaging. Hey hey hey, don’t judge me…I know you do the same thing. Sooth stressed skin in day time. Provide lifeless skin by lack of sleep. HYDRA GEL formula heighten moisture like wrapping. Before sleeping, on the last skin care stage, absorb right amount except eye rim and lips and wash of with tepid water next morning. They have a very mild, fresh scent. The A’pieu mask’s tub looks fun and absolutely adorable! It’s made of thick, sturdy plastic. The plastic cover under the lid does look more heavy duty than the ones that come with many products packaged this way. If I did have one complaint, it would be that I wished A’pieu would provide a spatula as I do find it quite unhygienic having to dip my fingers into the product at every use. Overall, I tried the A'PIEU Good Night Water Sleeping Mask on my face and on either side of my hands. I couldn’t tell any difference in the time it took for each of them to be absorb into the skin. Neither products were sticky, but provided a slick, satisfyingly smooth layer of hydration when applied on the face. Such a cute packaging and thanks for shared with us.